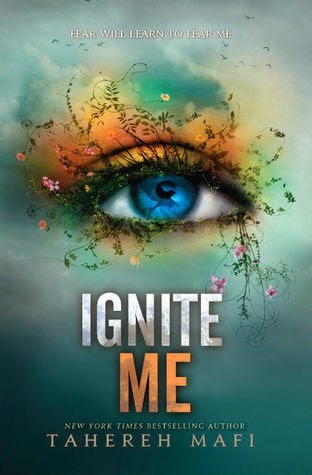 So like I have said in my previous reviews for Shatter Me and Unravel Me, how beautiful are these covers?!! I honestly think this is the best one out of them all. Did anyone else notice the bird in the eye? Can I just say I love Kenji!!! oh my gosh like I just want him to be my best friend! I got so angry with Adam in this book and I just completely lost hope in him getting back with Juliette and I completely fell for Warner. In shatter me I really didn't like him, Unravel me turned me to start liking him and now oh my. Some of things that Adam did and said left me gasping in shock and I was so surprised. All the characters in this final instalment had really good character development and the writing was oh so incredible as ever. Like Tahereh stop being so talented! haha just kidding. Who thinks that it would be really cool to have a book in Kenji's p.o.v because I am down for that. Overall: If you have not picked up this series yet. please go do it now, I cannot believe I waited this long to pick it up but I am so glad that I didn't. I think this is in my top 5 favourite series now. It is that good. What pages were the second and third quote on? Sorry, I am not sure what pages they are on, I read this on my kobo and got the quotes that I liked off goodreads. I loved Kenji! I really hope he gets a novella. And I was also shocked by Adam, he turned into such a jerk. But you're right, everything wrapped up perfectly and now it's one of my favorites too. I heard so many things about that series, but i didn't read it yet. Unfortunately,i heard that in my country, the translation, destroyed the original atmosphere and i want to read it in english. But I can buy from Amazon... Maybe, one day I'll red this book, decause I wish very much.